Saturday, September 12th at 10:00 AM. Christine will discuss how the retirement landscape has changed over the last 30 years and the challenges that current and future retirees face as a result, including the disappearing traditional pension and historically low interest rates. She’ll then share her recommendations for how to deal with these challenges by using the “bucket” approach to retirement portfolio planning. She’ll also provide some sample portfolios, using ETFs and mutual funds, using the bucket strategy. 2. The bucket approach to retirement portfolio planning. 3. Sample portfolios, using ETFs and mutual funds. 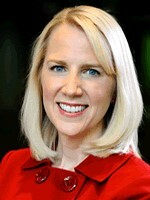 Christine Benz is director of personal finance and senior columnist for Morningstar.com. She is the author of “30-Minute Money Solutions: A Step-by-Step Guide to Managing Your Finances.” In addition, Benz is a co-author of “Morningstar Guide to Mutual Funds: 5-Star Strategies for Success,” a national bestseller. Before assuming her current role in early 2010, Benz served as Morningstar’s director of mutual fund analysis and editor of Morningstar Mutual Funds, Morningstar Fund Investor, and Morningstar Practical Finance newsletters. She is frequently quoted in the media, including The Wall Street Journal and The New York Times, and has also made numerous appearances on CNBC, CNN, NBC and PBS. Benz holds a bachelor’s degree in political science and Russian/East European studies from the University of Illinois at Urbana-Champaign.